Create beautiful collages for your clients in minutes. 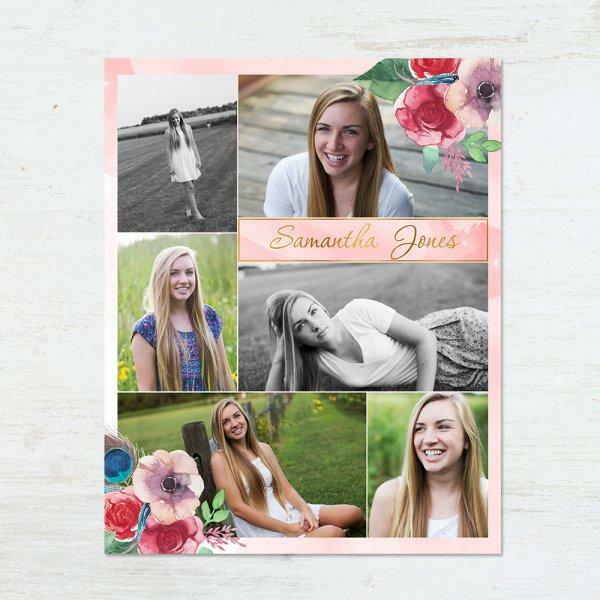 Our collage templates are made in Photoshop and can easily be adjusted for each client. A must in the arsenal of any photographer! Preserve your memories in a lovely and delicate way with this Collage Board template for Adobe Photoshop, a unique touch for your home! Preserve those adorable family memories with this delicate collage board template for Adobe Photoshop! Organize your photos in a unique and colorful way with the help of Photoshop collage templates from Sleeklens. 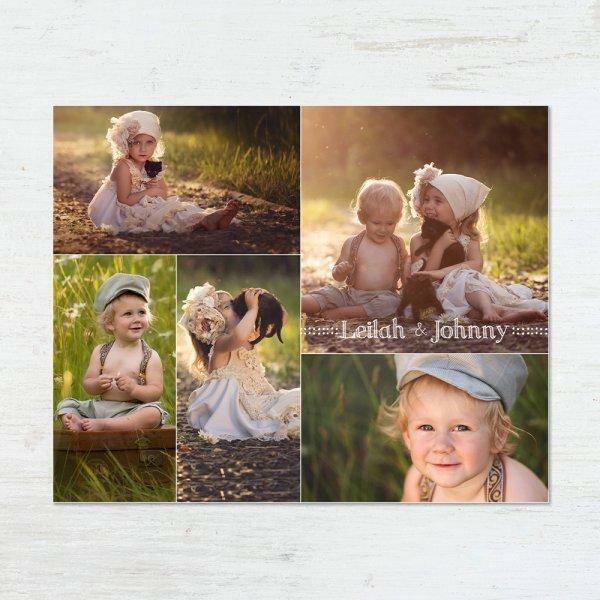 Whether you want to put your wedding or graduation photos together in a way that is absolutely unique, these templates are guaranteed to give you the best results at any given time. These strikingly beautiful and simple collage makers allow you to arrange your clients’ photos in a way that will not only look attractive but also professional. These templates are completely editable thus allowing you to write different photo details on the Photoshop collage before sharing or saving for your future browsing. You can replace the different photos anytime and use the ones that look catchy to you wherever and whenever you want. 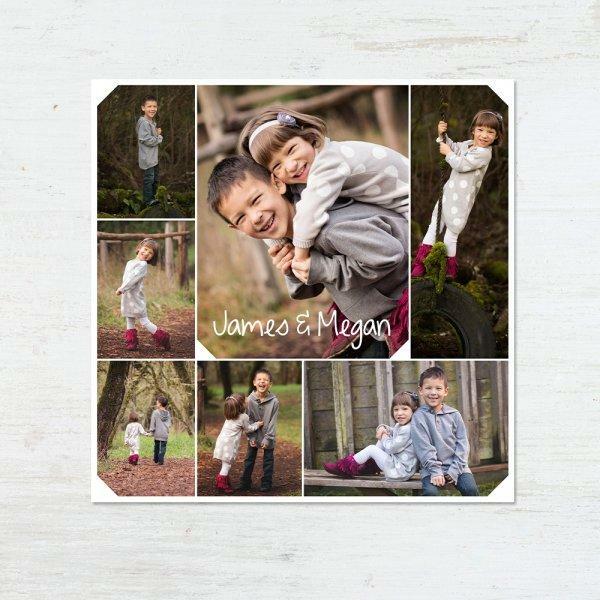 The collage templates are designed to give you great inspiration as you will have multiple layouts to choose from. There is no chance of getting bored with your work as these multiple layouts will always arouse your interest to do something absolutely new and unique altogether. You can now bring those precious memories closer to date with this gorgeous template. 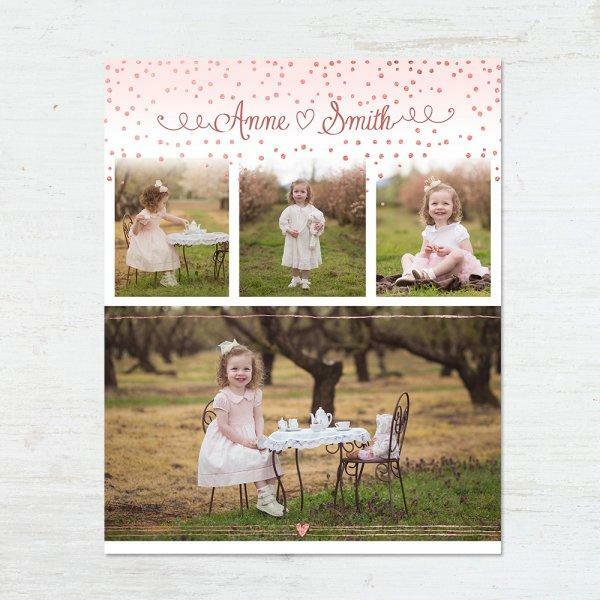 Whether it is a collection of your wedding or birthday photos or even lovely baby photos you took years ago, the template gives you a canvas to work with as you arrange them in a systematic way. The beauty with this collage maker is that you do not have to waste a lot of time arranging the images since the layout has been created for you and all you need to do is to drag and drop your images with absolute ease. This digital template has a dimension of 50.8 by 40.5 centimeters and comes with two files options, front and back. You can easily fit up to 5 images on this collage board template, enough to travel down memory lane. The collages you make with the help of this template can be printed in any major pro lab, shared on the social media platform or send through email to friends and family members. 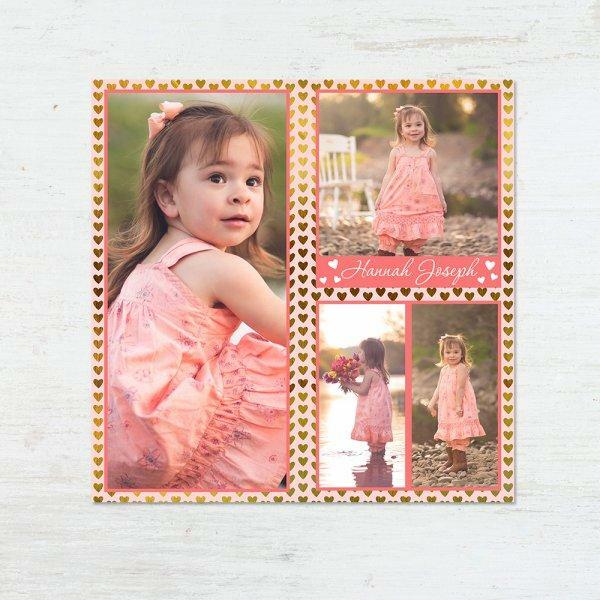 As cute as a newborn, this collage template will definitely keep you inspired as you organize your lovely images in an orderly manner. The captivating squared collage maker is big enough to accommodate 3 images as it comes with a dimension of 40 by 40 centimeters. It is also completely editable and you will receive a list of all the fonts you can use for easier search and download from respected designers. The fonts have been excluded in the template you download due to copyright issues. However, they are free and easily accessible online. My Little Princess comes in Layered Photoshop (PSD) files of 300 dpi and has clipping masks which you can use to add and resize your images within a matter of seconds. If you do not like the hassle of cropping images and the mess it creates, the clipping masks will prove to be effective and friendly for you. The collage template is compatible with Photoshop CS+, Photoshop CC and Photoshop Elements 7-14. 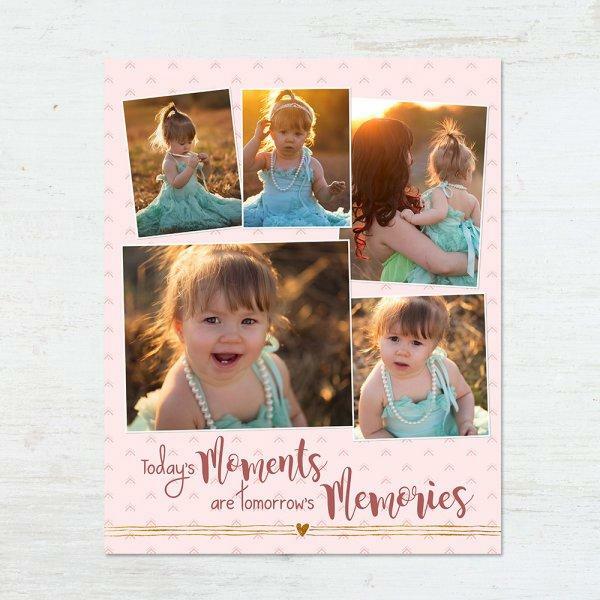 If you are looking for a bigger collage maker that accommodates most of your family photos, then Our Family Tale is the template to pick. It is designed to accommodate 7 images and has a dimension of 50.8 by 40.5 centimeters. It also comes with fully editable text and can be used with both Mac and Windows operation system. As you use this template, you can rest assured of a great-looking background that matches well with different photos, be they family portraits or personal images for different occasions. 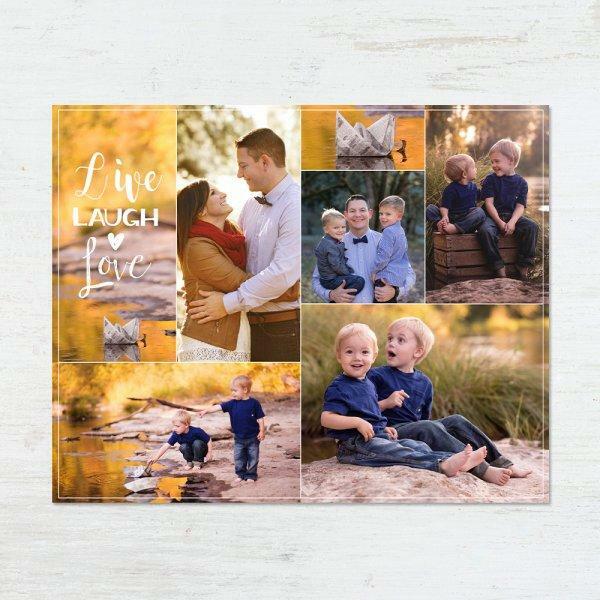 Just put your family reunion photos in colorful collages with the help of this lovely template. With Forest Trails, you will be able to create unique photo frames that will be catchy to the eyes but within a very short time. This template has a dimension of 50.8 by 50.8 centimeters and can fit 7 images in a very organized manner. The collage board template has two file options; front and back and is in Layered Photoshop (PSD) files, 300 dpi. As you use this template, you will be able to edit the text fully and add your images with ease thanks to the inclusion of clipping masks which allow you to add and resize the photos before printing or saving your collage. You will need to have one of the compatible versions of Photoshop software in order to use this template. Little Dots can fit 4 images and comes in a dimension of 40 by 40 centimeters. It is compatible with Photoshop CS+, Photoshop CC and Photoshop Elements 7-14. The background offered by the template is not only cute but also catchy plus you’ll have a long list of font options which you can download from the internet for you to use in your work. The collage board template works with Mac and Windows operating systems. Preserve your today’s images in a way that is easily sharable and enjoyable to scroll through for the future generations. As you come together during those happy family reunions, the photos you take will need to be put together in a manner that will make them sharable with the future generations. This template has a dimension of 41 by 51 centimeters and is designed to hold 5 images thus leaving your collage looking organized. You will find instructions included in the template in addition to a font list for easier user. This is a squared template measuring 50.8 by 50.8 centimeters. The template is designed to fit 6 images thus allowing you to create some colorful collages which you can print or share easily with your friends and family members through emails or social media platforms. The collage board template includes 2 file options (front and back) and its text is completely editable. You will need to have Photoshop CS+, Photoshop CC or Photoshop Elements 7-14 installed in your computer for you to be able to use the template.